Northants all-rounder David Willey says he is yet to show his best in an England shirt. The 25-year-old took 10 wickets in three one-day internationals and a T20 match against New Zealand in June. "I didn't feel like I bowled to the best of my ability at times, but to pick up wickets in one-day cricket is always nice," said Willey. "From a personal point of view I know there is more left for me to improve on." Willey is out until the end of July with ankle ligament damage, with England's first T20 game against Australia scheduled for 31 August. His international debut in May's ODI against Ireland was ruined by rain, but his Northants form earned him a call-up against New Zealand. 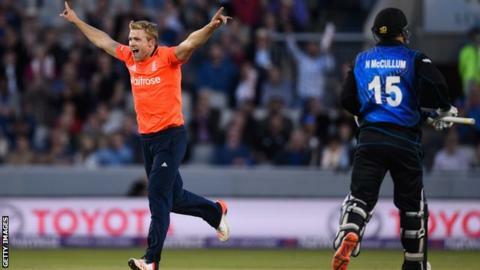 England won the one-day series 3-2, and Willey took three wickets as the hosts were also victorious the T20 match. "In Ireland it rained so we didn't get a full game in, and it was on a club wicket which didn't do much with the new ball," Willey told BBC Radio Northampton. "To come back here, get selected and play on flat wickets was a challenge. "It wasn't easy for the bowlers, but the quality of cricket and the style England and New Zealand played in - it was great to be part of a winning series." IPL - the Indian Problem League? Read more on Has Indian Premier League become Indian Problem League?